Last time I tried to familiarize You with Online Charging System (OCS), with was a introduction to Gy based on a diameter. But before I will go to the diameter, and all those CCRs and CCAs just I wanted to talk about Offline Charging System. What is Offline Charging System (OFCS)? Offline charging is a process where charging information for network resource usage is collected concurrently with that resource usage. The charging information is then passed through a chain of logical charging functions, which are described below. At the end of this process, CDR files are generated by the network, which are then transferred to the network operator's Billing Domain for the purpose of subscriber billing and/or inter-operator accounting (or additional functions, e.g. statistics, at the operator’s discretion). The BD typically comprises post-processing systems such as the operator's billing system or billing mediation device. Generally offline charging is a mechanism where charging information does not affect, in real-time, the service rendered. As it's always good to start with a high level design picture, let's start. BD: Billing Domain. This may also be a billing system/ billing mediation device. Below CTF, CDF and CGF functions are described. depends on functions/service that the network element provides. The Account Metrics Collection can therefore be considered as the network element dependent part of the CTF. This process receives the collected accounting metrics and determines the occurrence of chargeable events from a set of one or more of there metrics. It then assembles charging events that match the detected chargeable events, and forwards the charging events towards the Charging Data Function via the Rf interface. (Being completely honest, Gx interface is being used between PCRF and PGW to transfer policy and charging rules, and it is described in more details in TS 29.212) The charging events provide information pertinent to the chargeable event, i.e. characterising the network resource usage together with an identification of the involved user(s). There is no assumption of any synchronisation between the reception of individual accounting metrics, however, it must be possible for the Accounting Data Forwarding to complete its overall functionality per charging event in real-time. 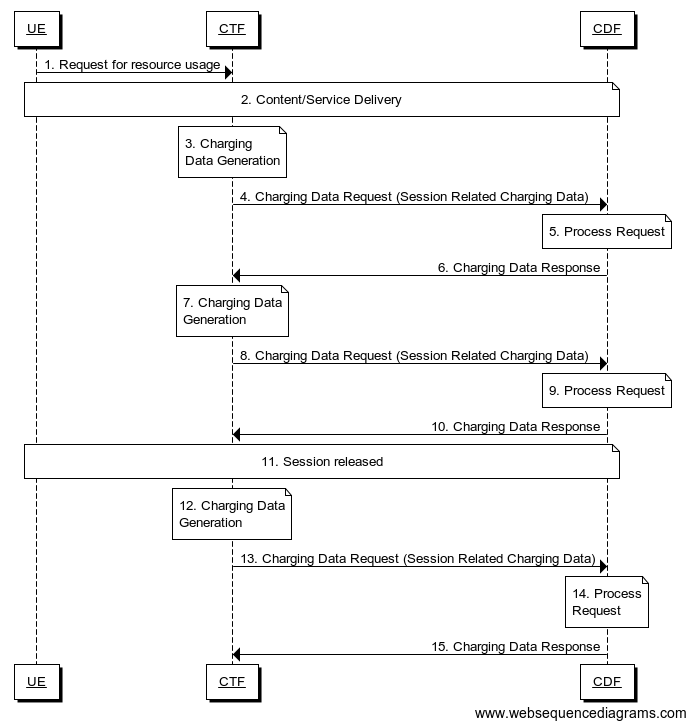 While the exact information received by the Account Data Forwarding from the Account Metrics Collection, and the relevant chargeable events, are specific to each type of network element, the overall functionality of receiving, assembling and forwarding the charging information can be considered generic. Hence the Accounting Data Forwarding is considered the NE independent part of the CTF. CDRs may be constructed fro single charging events, i.e. a 1:1 relation between event and CDR. The result of the CDF tasks are Charging Data Records (CDRs) with a well-defined content and format. The content and format of these CDRs are specified per domain/subsystem/service in the related middle tier charging specification, e.g. 3GPP TS 32.250 for the CS domain and 3GPP TS 32.251 for PS domain. CDR reception from the CDF via Ga interface in near real-time. CDR routing and filtering, i.e. storing CDRs on separate files based on filtering criteria such as CDR type, CDR parameters, originating CDF, etc. In the following scenario, CTF asks the CDF to store event related charging data. 1. Request for resource usage: UE-A requests the desired resource from the network element. 2. Content/Service Delivery: the network element delivers the content/service. 4. Record Charging Data Request: the CTF requests the CDF to store event related charging data for CDR generation purposes. 5. Process Request: CDF stores received information. Whether the CDR is generated or not depends on CDR generation configuration. 6. Record Charging Data Response: the CDF informs the CTF that charging data was stored. In the following scenario, CTF asks the CDF to store session related charging data. 1. Request for resource usage: UE-A requests the desired session from the network element. 3. 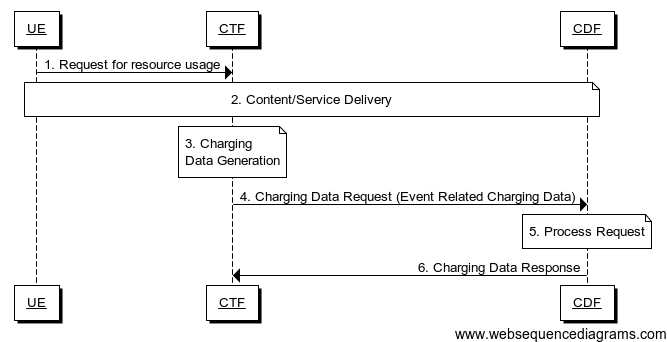 Charging Data Generation: the CTF generates charging data related to session. 4. Record Charging Data Request: the CTF requests the CDF to store session related charging data for CDR generation purposes. 8. Record Charging Data Request: the CTF requests the CDF to store session related charging data for CDR generation purposes. 9. Process Request: CDF stores received information. Whether the CDR is generated or not depends on CDR generation configuration. 12. 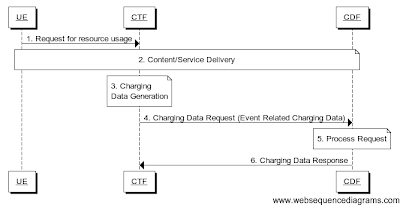 Charging Data Generation: the CTF generates charging data related to session due of session termination. 13. Record Charging Data Request: the CTF requests the CDF to store session related charging data for CDR generation purposes. 14. Process Request: CDF stores received information. Whether the CDR is generated or not depends on CDR generation configuration. 15. Record Charging Data Response: the CDF informs the CTF that charging data was stored. Charging Data Request, sent from CTF --> CDF. This message is sent after detecting a chargeable event, the CTF sends a Charging Data Request to the CDF. Charging Data Response, sent from CDF --> CTF. CDF replies with a Charging Data Response, which informs the CTF that charging data was recived. Thank you for your informative explanations. One question: If the Gy is for online charging and the Gx is for offline charging, is the Gx also used for policy control of online charging or is that the sole responsibility of OCS via Gy? - Push Procedure, PCRF originated Re-Auth Request (RAR) message and Re-Auth Answer (RAA) from PCEF. Messages are sent through Diameter based interface. More on PCC related 3GPP Technical Specifications are 23.203 and 29.212. Anonymous, first of all, Gx is not for offline charging, rather for usage monitorung but can be configured with charging controll manner. E.g. Subscriber has reported 10000000 octets from youtube today, it is the daily limit and appropriate prohibiting PCC rule could be sent for the subscriber. It is not Online or Offline charging control. It this case we can`t guarantee exact 1000000, if this amount were reported than a bit more octets were consumed already and no charging function. Traditional Diameter charging model is post paid. It inconvenient and risky for subscribers and ISPs. Charging control via Gy uses pre-paid model. A service won`t be granted if it has not been approved (and counted) by OCS. Here charging and control enters into the game. e.g. A subscriber has some account balance (in time, moneys, octets and so on). PCEF seeing the subscriber`s requests asks OCS "could I provide this service?". OCS makes reservation of some amounf of "money" and allow the service or not if quota exceeded or account balance too low. In reference model Sy is lying between PCRF and OCS, but now PCRF and OCS can be located on one hardware platform or be the same software. Gx over Gy looks obsolete, but maybe two diameter connections is not so bad. :) Or it can be one vendor desined, depending on your equipment. Thanks Nikita for updating, really appreciate.